Are community services in BC under attack? It continues to be a time of transition for the employment service sector as contractors and subcontractors to the WorkBC program transition to the new contracts. No official announcement has been made as I write this, but I am interested to know how the former contractors and subcontractors are faring under the new contract environment. We’ve been contacted by The Federation of Social Services of BC and Board Voice who are concerned about the effect of the new WorkBC contract awards on the ability of social service organizations to remain viable within the communities they serve. Is it really feeling like BC non-profits are under attack? I am always intrigued and delighted by the ingenuity of the service providers to respond to funding shifts and market needs. As a sector, it is our competitive advantage and is something that I refer to often in my advocacy work to employer stakeholders and government. This ingenuity is not limited to our non-profit members but also our private members: both can be described as community benefit organizations. For the past two years, I have been a board member for 3rdVoice representing the interests of ASPECT members. We have been working to providegovernment with community-up ideas and provide a collective voice to the needs of a diverse range of provincial organizations, networks, and federations. There have been some successes, but for a variety of reasons 3rdVoice has been challenged to produce statistics and measures to clearly demonstrate the value (both economic and social) of community benefit organizations in BC. Our hope is to mirror some of the effectiveness of the Ontario Nonprofit Network (ONN). 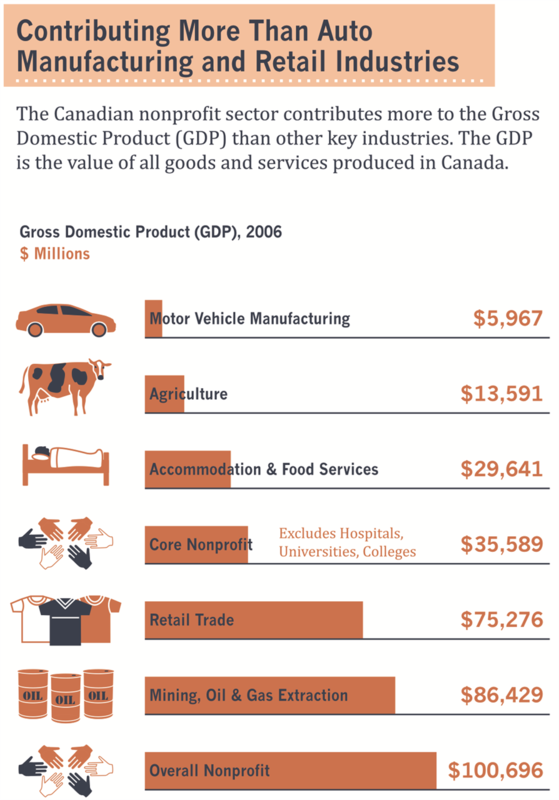 ONN produced an infographic a few years ago that shows the economic impact of non-profits in Ontario, and when you look at the statistics that they have collected, its mind-blowing! We needthat information in our province to prove to anyone who will listen that community benefit organizations and their economic and social impact is a force to be reckoned with. Last week I was in Vancouver meeting with my 3rd Voice-colleagues to discuss among other topics, how we can collect compelling data in BC. We asked questions such as: How many non-profits are there within BC? Who do we include in our data collection? What kind of data do we collect? How do we gain access to the information we need? and what other organizations should also be at the table? Over the coming months, our plan as 3rdVoice or as just a collective of community benefit organizations, will be to reach out to several organizations to see if we can collect the information we need. Accordingly, ASPECT will be polling its members to find out our impact on our economic and social health of the province. As service providers, we know that policing in our communities is negative result to an underfunded community supports. A healthy and vibrant community service environment saves tax payers’ money in the long run. We just need the numbers to prove it. As always, I welcome your comments at any time and would like your help collecting statistics to share with my colleagues at 3rd Voice. What statistics do you use to promote your own organization to your funders and community stakeholders? What are your measures of success? Please send me what you have, copies of your Annual reports, or anything you can that would help us determine what success is for community services in BC. I will keep you posted on this endeavour and share what I can moving forward. It’s been a challenging week for many within the employment services sector as they are learning the fate of their own employment future. I have been reassured by several of the new WorkBC contractors that they will be reaching out to you, if they haven’t already. Being one who is uncomfortable when things are left up in the air, I empathize with your situation. There continues to be a need for career developers outside of the WorkBC contracts; check out our ever-growing list of job postings for new and exciting opportunities. It is my hope that those currently working within the sector will be able to stay here. 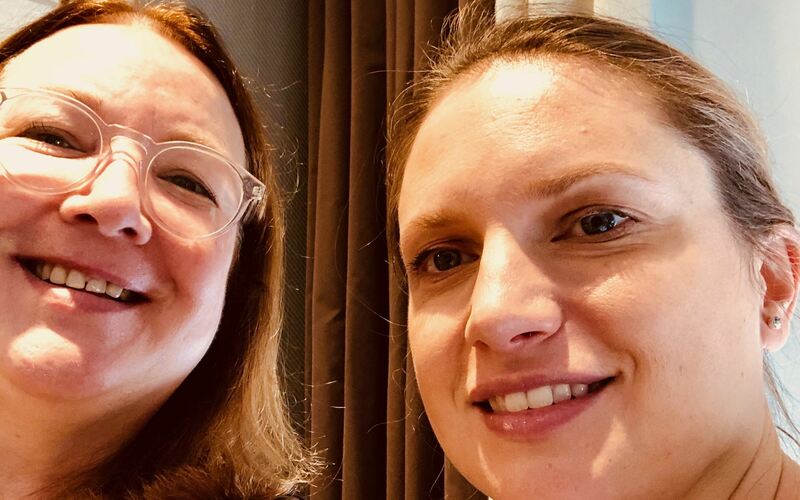 Building expertise in the sector continues to be a focus for ASPECT and this week I met with Dr. Roberta Neault to discuss developing an affordable yet high-quality leadership training path for those who are already leaders and those who are looking toward leadership positions in the near future. We hope to have the details sorted by the beginning of January. Strategic Business and Procurement Transformation Branch will be facilitating the workshop. It is amazing to me how she is able to take a fairly dry topic (for me) and make it fascinating. We are delighted that she has agreed to help us out again. Finally, we are in the process of developing free or economical webinars for those who did not have the opportunity to attend last November’s ASPECT Conference. We are reaching out to conference presenters to see if they would like to present again in a webinar format. The feedback we received from this year’s ASPECT Conference has been the best yet! We want to ensure that everyone has access to the valuable learning available within the sector. Now that the contract announcements have been made, we can move forward with the advisory committee for the ASPECT Employer-Service Provider Summit which is scheduled for June 4 & 5, 2019 in Richmond. I already have a list of senior practitioners and employment service leaders, but if you are interested and have not told me already, please let me know if you would like to attend our virtual meeting. 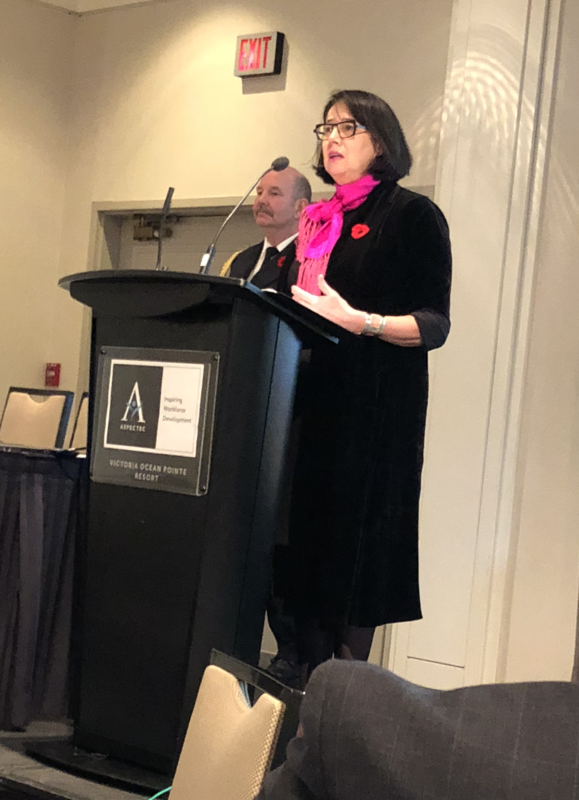 I've just returned from Ottawa after an inspiring two days of meetings with career development practitioners and experts from across Canada. ASPECT, along with BC Career Development Association (Lubica Keighery, Executive Director in photo at right) and 33 other organizations, have been asked to be a part of a Supporting Canadians to Navigate Learning and Work National Stakeholder Committee (NSC) to help facilitate multiple stakeholder meetings within our regions. These consultations will have several different levels of engagement and will include a diverse compilation of expertise. Funded by Employment and Social Development Canada, the Canadian Career Development Foundation and the Canadian Council for Career Development is at the start of a 3-year project to define the scope of Career Development as a profession and the attributes that determine excellence. I'm bound by secrecy (partly joking) to say much more until we have a communications directive in the new year. I'll keep you posted. 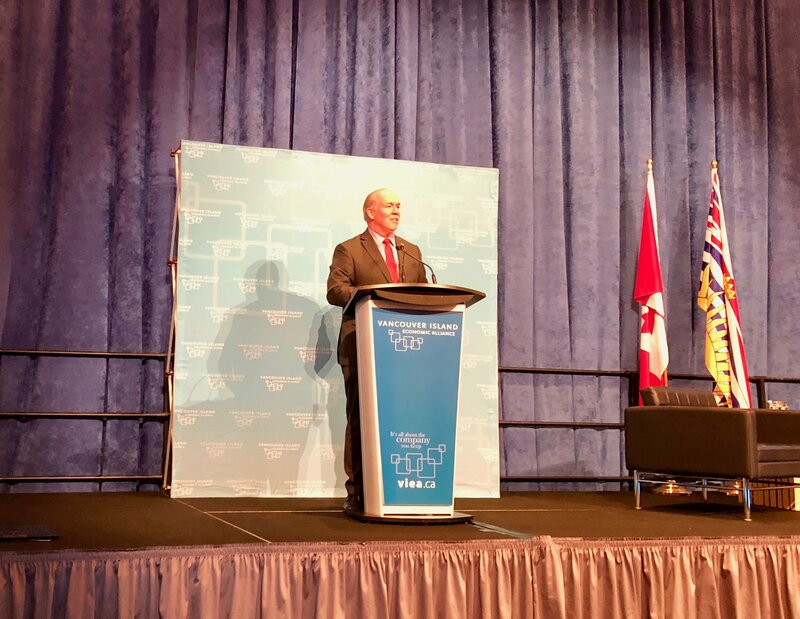 Last week I had the opportunity to attend the Vancouver Island Economic Summit in Nanaimo and was delighted to run into several ASPECT members. My goal for being at the conference was to meet as many employers and employer representatives as I could to find out their needs. 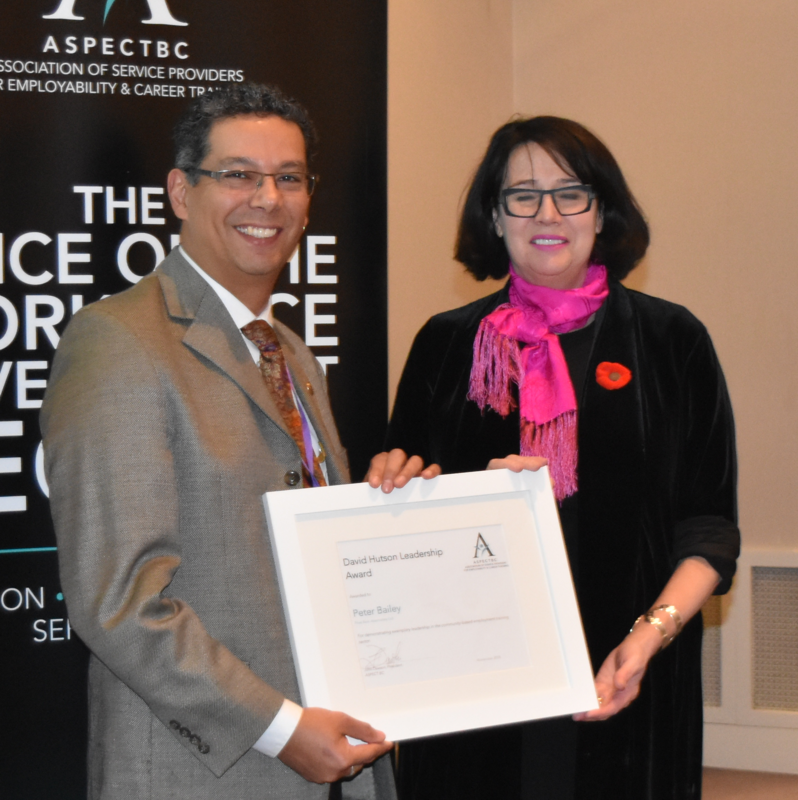 I'm researching how ASPECT can coordinate its members' expertise to meet employers' needs at a provincial level. I heard -- almost as an unofficial reoccurring theme throughout several of the presentations and workshops -- that employers desperately need skilled workers to compete locally and globally. It struck me that I was certainly in the right place at the right time! 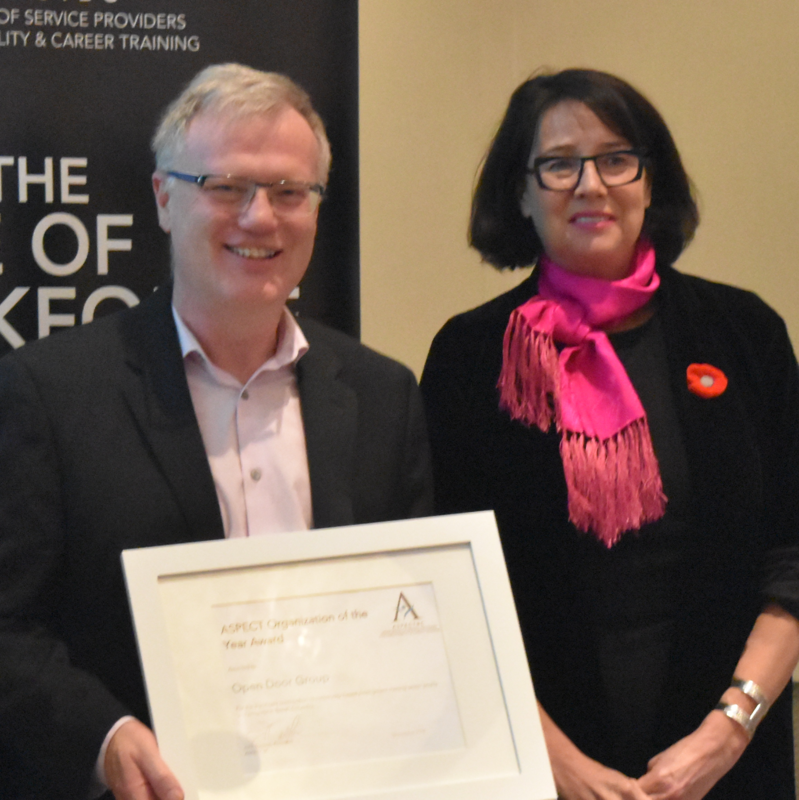 ASPECT is currently developing an Employer-Service Provider Summit hosted by ASPECT in June 2019. The initial plan is to host a provincial summit in the Vancouver/Richmond with large employers and then do regional meetings with local employers in fall 2019. If you are interested in being a part of the ASPECT Summit Steering Committee, please send me a quick email. I'm delighted to announce that one of the Pre-Conference Workshops on November 7 will feature staff from the Ministry of Advanced Education and Skills Training and the Ministry of Social Development and Poverty Reduction. This co-facilitated workshop hosted by the Ministry of Advanced Education, Skills and Training and the Ministry of Social Development and Poverty Reduction, will provide an overview of impacts and opportunities of the new WDA and LMDA and how they are working to better align BC labour market programming. Join us for a lively session to explore how Service Delivery Partners and Ministries can work collaboratively to achieve the best outcomes for clients. 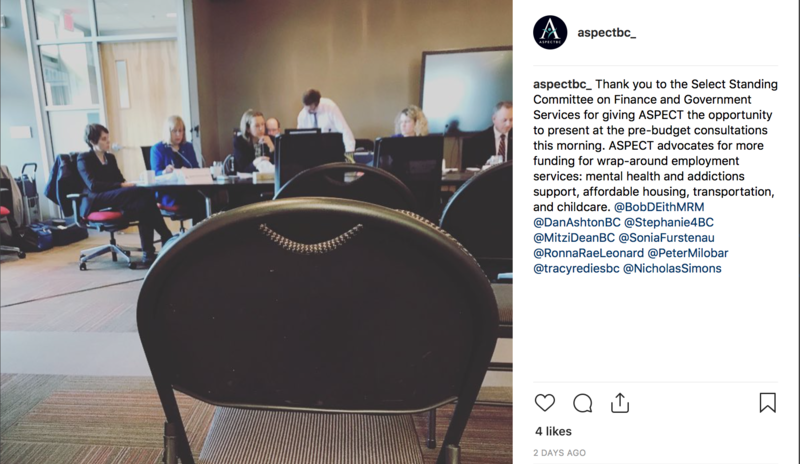 After an update on the BC labour market, followed by brief presentations on the LMDA and the WDA, we will then break out into tables to discuss how we can improve the referral process between WorkBC centres and AEST-funded programs. This pre-conference workshop is an additional $25 to the regular conference rate. If you've already registered and would like to now register for this workshop too, please email us and we can update your registration. If you haven't yet registered, please do so now! See the Conference website program to find out what else is in store. On Tuesday, I presented to the Select Standing Committee on Finance and Government Services. 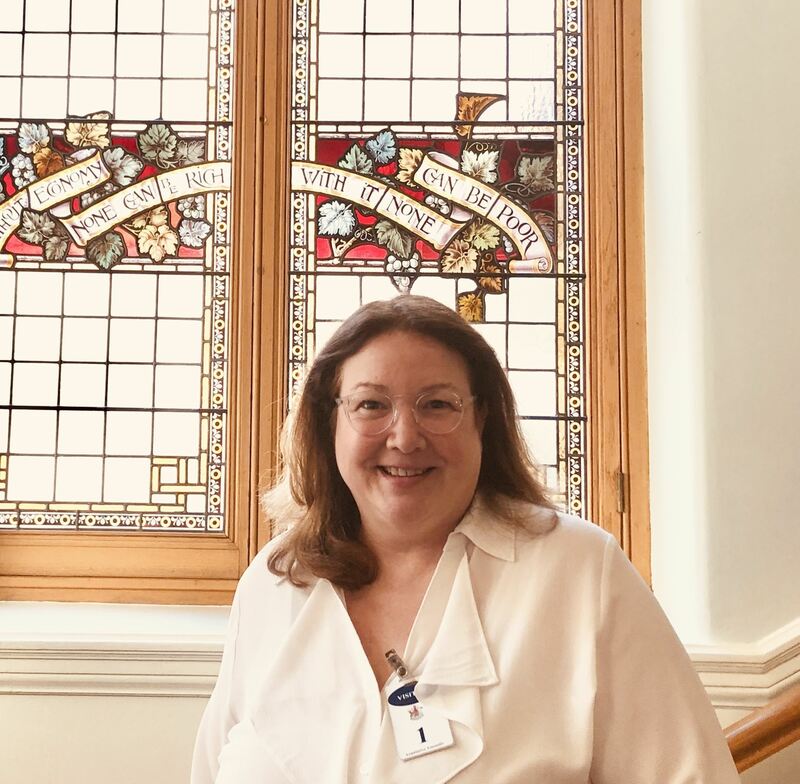 I was delighted that the speakers that preceded my presentation were also asking for, or talking about, the same issues as I was although from a different perspective. Housing, addictions and mental health, transportation and child care are barriers to employment. More opportunities to provide presentations, videos, and submissions to the Committeecontinue from now until Monday, October 15 at 5 pm. On Wednesday I had an exciting meeting with my friends in the Ministry of Advanced Education and Skills Training: Rishi Sharma, Director of Corporate Services Unit, Laura Colpman, Senior Advisor, and Bev Shuttleworth, Manager, Indigenous Relations, Workforce Innovation and Division Responsible for Skills Training. It got so exciting we even pulled out the whiteboard pen to jot down some ideas. The impetus of the idea, that we independently all came to the table with, was creating an opportunity for employers and service providers to get together and share information and ideas. I'll have more information for you by the ASPECT Conference, but in the meantime, I'll be setting up an online discussion group to talk about the needs of employers in your communities and how ASPECT can better meet those needs. Please stay tuned. 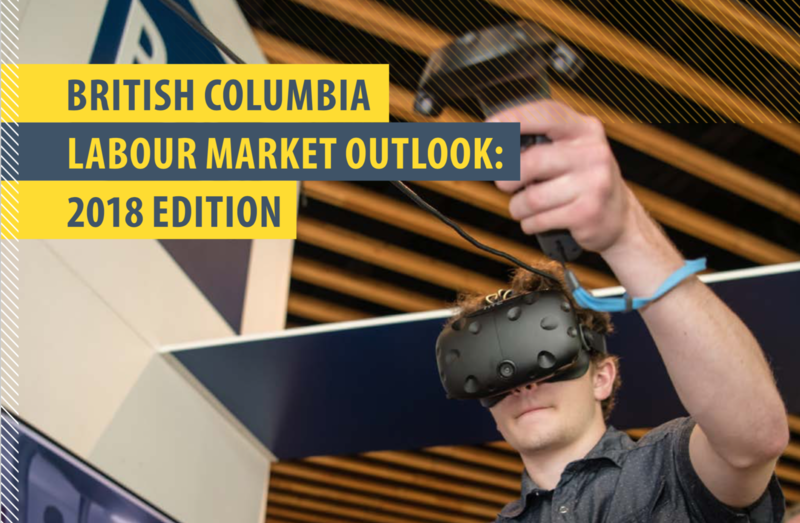 This morning I finally tucked into the 2018 edition of the British Columbia Labour Market Outlook that was released September 6th. It is a 104-page document produced by the provincial government and is an impressive compilation of the market outlook, the successes achieved (thanks to ASPECT members), and the regional and job-specific considerations. On Tuesday morning, I'll be making a 5-minute presentation to the Select Standing Committee of Finance and Government Services on your behalf, and the Labour Market Outlook is just one of the pieces that informs my presentation. The most important part of my message will be stories from ASPECT members about the challenges and successes your clients encounter finding meaningful and sustainable livelihoods. ASPECT members tell me that the barriers to employment continue to be mental health and addictions, childcare cost and availability, housing, and transportation. Although we've seen some movement on these issues over the past year and I am cautiously optimistic, I will once again focus on these barriers and request that more funding is invested in these areas. Finally, I will champion ASPECT members and the work you do every day. Employment services and training are not always easy to understand if you are working outside the sector; therefore, I will ensure that those on the Committee know who you are and what you do.